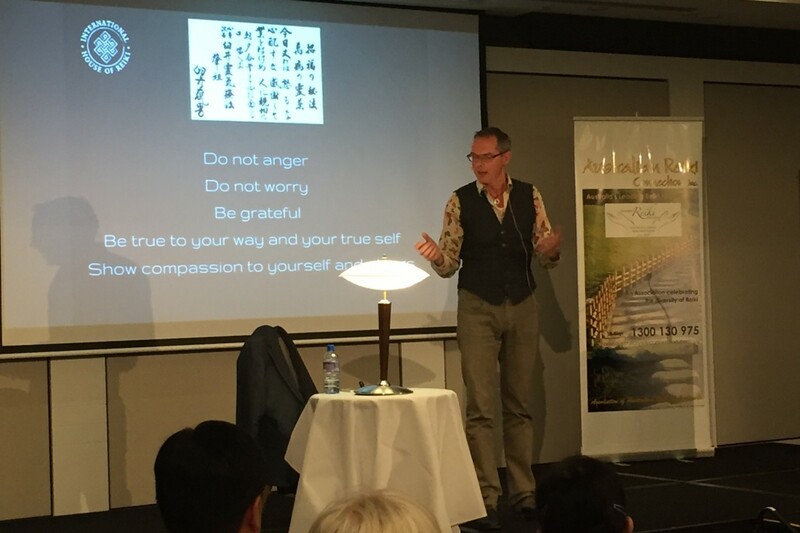 I recently returned from the Australian Reiki Connection (ARC) International Reiki conference in Sydney, on the fantastic topic ‘The future of Reiki’. The ARC committee did an amazing job bringing the conference together; and I can only begin to imagine the efforts and time involved, for which I know all delegates are extremely grateful. An eighth speaker Anthony Turner, who has podcasts available on his Business Success Radio, spoke about his ability to support business owners in creating a sustainable business. Additionally, Malcolm J Hunt (who returned to Australia in 2014 after experiencing life as a Buddhist Monk in China) started the proceedings by speaking about mindfulness and leading us through a short meditation. Tony S Carroll, ARC Treasurer and Administrator, was the event MC. One of the most heartening discussions was around the different forms of Reiki practiced and the opinion that no matter our lineage (the path that can be traced from an individual to their teacher and then right back to the founder of the system of Reiki, Mikao Usui) we must be united, as the reason behind our interest in pursuing Reiki is always the same- the hope of becoming healed. This viewpoint recognises that we are all unique and therefore different forms of Reiki (just like different forms of yoga for example) may appeal to us. Neither is better or worse than the other, we are simply following our own path towards increasing the levels of peace and wellbeing we experience, amongst the stress of modern day living. In my opinion, this can easily be applied to encompass all healing modalities we may choose to explore whether out of personal interest, when faced with illness/ dis-ease or when looking for more meaning in life. The use of Reiki in healthcare was discussed, including the introduction of Reiki into some hospital cancer treatment regimes around the world. Reiki is currently more accepted in this capacity in the United States (see below) and the United Kingdom, where the ‘Sam Buxton Sunflower Healing Trust’ has been established to help fund Reiki treatments for cancer patients and is supported within the English National Healthcare System (NHS). (I would like to acknowledge the use of Reiki in the medical system here in Perth, as part of SolarisCare Cancer Centre at Sir Charles Gairdner Hospital- including their regional centres in Albany and Bunbury; and at St John of God Hospital in Subiaco). Pamela Miles connected with the conference via live video link from New York. Pamela has been influential in pioneering the use of Reiki within conventional medicine in the US and has been published in peer reviewed medical journals including the journal of the American College of Cardiology. Pamela attributes her success within the medical community, to the sharing of common values (between medical and reiki practitioners) such as a mutual aim to do no harm. Pamela shared that within the healthcare system it is acknowledged that any patient facing illness who is able to draw on inner resources, including spirituality will experience better outcomes. By being clear about what a Reiki treatment looks like and providing easily relatable information when answering questions we can work together to reduce scepticism around the benefits of Reiki. Pamela also sees daily ‘self Reiki practice’ as a value Reiki practitioners around the world can share. (We must first experience and maintain our own sense of balance before we can help others to do the same). Paul Mitchell started his talk by asking the audience questions designed to connect us with our first experience of Reiki, the reasons we decided to become Reiki practitioners/ teachers and why we are still practicing today. Motivations such as peace, bliss, curiosity, helping ourselves and others and (seeing the practice of Reiki as) an ongoing journey were common themes. Paul spoke of his view that (an understanding of the system and practice of) Reiki can lead us to reach beyond ourselves to benefit the common good, via a continual process of awakening and letting go. Frans shared his belief that the future of the world is compassion. At the heart of all human beings exist our infinite beauty, warmth, compassion and expansiveness, yet as we face challenges in life feelings of worry, fear and anger may begin to grow inside us. These feelings dim our inner light, our sense of peace and connection to the world around us, yet the more we practice Reiki (for example through meditation, contemplation of the Reiki precepts, breathing techniques, chanting, hands on healing etc.) the more we can clear these emotions away and return to a place of balance. Frans compares our inner light to that of a lamp. If the lamp is switched on but is covered by a blanket (representative of worry, anger etc.) and we can no longer see the light being emitted, does it mean that it no longer exists? He discussed that the reason most of us struggle to embrace the lightness within us is because it means embracing change, letting go (of what we ‘know’) and being open to, or rediscovering, different perspectives. Frans teaches that we should not just practice Reiki we should BE Reiki. After all, can we ever truly share kindness with others if we aren’t first kind to ourselves? When Kathleen took the stage, speaking of the many animals that have shaped her journey and shared the lessons they have taught her, my heart exploded with joy and tears came to my eyes… and I know others attending felt the same way. Kathleen is at the forefront of Animal Reiki education and speaks from her great love of all animals, emphasising the need for a very gentle approach when offering Reiki to our sensitive animal companions. She teaches that the best way to share Reiki with animals is to meditate with them and invite them to share that space with us, dropping any and all expectations of the outcome. Kathleen’s speech was illustrated with stories and pictures of animals including: her beloved horse Shawnee who was in a bad way when Kathleen first met him but flourished with Reiki and is now 28 years old; a paraplegic pig named Harley (from BrightHaven in California) who radiated joy and happiness and helped all Reiki practitioners who connected with him to do the same; and the beautiful black leopard Makoto (from the CARE foundation in Florida) who was able to release his anger at past human mistreatment thanks to the peacefulness of Reiki. Kathleen spoke of her passion for her non-profit SARA- the Shelter Animal Reiki Association- which aims to get Reiki into animal shelters all over the world. (I am a proud practitioner member of SARA and have facilitated Cat Haven joining SARA as an organisational member). Kathleen also provided some tips for approaching veterinarians and animal caregivers, noting that we must be clear in stating that Reiki meditation is never a substitute for medical diagnosis and treatment. Most of all Kathleen urges us to be as present as possible and to see animals as our teachers in the journey. Hyakuten Inamoto Sensei, a Japanese Buddhist Monk from Kyoto, explained that Reiki is an art of surrendering, or giving and letting go. When asked what he teaches, he explained simply “Place your hands, surrender, smile”. He went on to explain that surrender is the most difficult part, because it is impeded by our ego. While our ego might serve us in our daily life, in spiritual practice we must learn how to set it aside by becoming increasingly more compassionate. Sensei says the Reiki precepts are the foundation for our spiritual practice: Do not worry. Do not anger. Be thankful. Be diligent. Be kind. Sensei asks us all to recognise and show gratitude towards Mikao Usui, as without him sharing his understanding of the gift of Reiki with others it would not exist today. Sensei looks forward to seeing the presence of Reiki grow around the world including in hospitals (giving thanks to Pamela) and with animals (giving thanks to Kathleen). William Rand shared his views of Reiki as a system that heals people and helps them to live better lives and expressed his gratitude that people are practicing Reiki in whatever form. William explained he believes Reiki provides a way in which we can ‘refine’ our personality enabling traits such as acceptance, forgiveness, love, kindness, and openness to more easily shine through and this then helps to set us on our unique path in life. He sees the future of Reiki being one where all Reiki practitioners work together to help bring peace to our planet. Sue Lake Harris connected to the audience by sharing her own experiences of how Reiki has helped her to overcome various health concerns. She shared that she initially came to Reiki as a sceptic, but after experiencing its benefits decided to learn and has now been a teacher for many years. Sue has also been instrumental in developing (in Australia) a Certificate IV in Reiki which once attained will support existing Reiki practitioners to gain employment in hospice care. It is my hope that this post has helped you to understand the many benefits and practical applications of Reiki in the world today and the great possibilities that exist for Reiki in the future. From my wonderful teachers I have learnt that Reiki is a system of meditation and contemplation that practitioners can utilise as a healing tool to help first themselves and later others, including animals. Reiki practice and treatments (whether ‘self’ treatment or provided as a service to benefit people or animals) promote relaxation and stress relief, inturn encouraging both activation of the bodies’ innate self-healing mechanisms and a state of balance in body and mind. At its heart Reiki is a spiritual practice of compassion for all beings, and within the system exists a spiritual path that for dedicated practitioners becomes a lifelong journey. I love Reiki and feel immensely blessed to have it in my life as a path that I can build on to increase my personal levels of peace, contentment, compassion, happiness and love (and to then expand that out via my business and volunteer work within the community). Of course, everyone is free to choose for themselves the tools in life that work for them; my hope for each of you reading this is that you are able to find the solution that resonates for you. Beautifully written and on point. Thank you for the summary and as an attendee i am now able review all these points and meditate with many in mind. Thank you for this comment on “The Future of Reiki” it nurtured my spirit. I experience my Reiki and I feel happy, but it comes sometimes downs or decrease of enthusiasm, then reading and practicin the Gokai daily helps to keep the fire. Hi Rosa, I’m so glad this article was able to nurture your spirit, that is lovely feedback thank you! Yes daily practice is the key. :) Cheers, Carolyn. I’m a Reiki Master And also Karuna Reiki. It’s my passion, would love to work in a hospital helping the sick. You’re welcome to include some quotes and provide credit back to the original article and this website (to honour copyright), or alternatively to provide a link to my posts on your website (if you wish to share the article in its entirety).